Denison La August 2, 1879 The Denison Total Abstinence Union met pursuant to adjournment. The meeting opened with singing and prayer by Mrs. Lanb. The minutes of the previous meeting were read and approved. A communication from the W.C.S.U. was read by the Secretary. 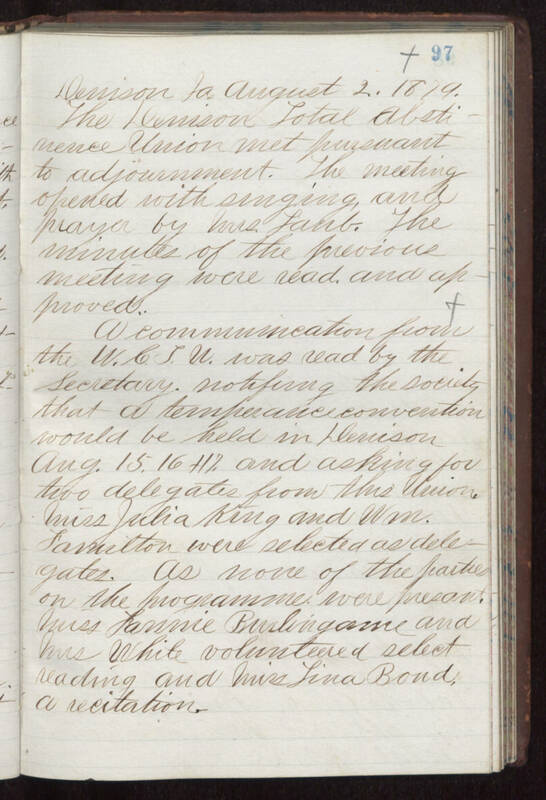 notifying the society that a temperance convention would be held in Denison Aug. 15, 16 + 17 and asking for two delegates from this Union. Miss Julia King and Wm. Famillion were selected as delegates. As none of the parties on the programme were present, Miss Lannie Burlingame and Mrs. White volunteered select reading and Miss Lina Bond, a recitation.